Steve says: The thematic essence contained in this new soundworld has haunted me since the late-90s, when I created a short piece for a compilation centered on the main harmonic chord cycle. Through the passage of time, the evanescent nature of this atmosphere only grew more poignant and deeper in emotional resonance. As life continues to be fully lived, blooming outwards and simultaneously mirrored with the passing of family, friends and animal companions, these emotions aligned and called on me. In a five day period leading up to my birthday in February 2017, I fully immersed in the feeling this echo in time delivered, realizing this long-form piece in totality. Steve Roach knew quite a very productive end of 2016 year with 3 albums appeared in December. And each of these albums visited the sound territories occupied by the American synthesist-philosopher since he released Now in 1982. I don’t count any more the albums since then, so much they are many and flooded in an impressive list of reissues. The last time when I tried a counting I believe that I had exceeded the point of 100 albums. But it doesn’t matter in that story! If some of his works sound as something of deja-entendu, in particular at the level of dark ambient music, others turn out to be monuments of pensive, meditative and transcendental music. Like this impressive The Passing whom Steve Roach wrote and performed in 5 days, just in time to be offered in downloadable format the day of his 62nd birthday on February 16th, 2017. Skillfully mastered by Howard Givens, this last album respires the soft perfumes of the best meditative music of the Californian musician sculptor of deep ambiences. A nth album of meditative soundscapes! The source dried up? Not at all! To say the least not here. The contemplative adventure begins with a deafened wave which spreads its presence like a guide making us discover the greatness of empty spaces. Foggy strands get out from this dense shadow which seems to float as in a passage towards another territory. We can hear secret flutes manipulate the incandescent heaviness of this shadow of which the whispers are reflected into a long ceaseless humming. It’s at around the 14th minute when the charm becomes obvious! Some slow wings which are bearer of sibylline harmonies begin to float all around this long wall of vocal drones, reflecting an attractive harmonious approach of which the equivalence is in this ghost melody that our ears savor since the first stammerings of Reflections in Suspension, but in a lento mode. And there far from me the idea to draw a parallel, because over the time I understood that there is only one Structures from Silence. All which looks like it, set apart Emotions Revealed, is but a mirage that we like comparing. But this winged melody possesses nevertheless the same effect of comfort, of to hear an old friend. We float within this minimalist melody to the uncertain and undoubtedly nebulous forms which presents constantly an accentuated inflection, like a fluttering which becomes viral. Sometimes I have the impression that Steve snivels through this opaque passage so much the tone of the melody is a reflection of condolence and where the slow movements in the wings loaded of ever-changing colors prostrate themselves as prayers. An insidious melody my friends whose meditative layers tangle the colors of the harmony in a slow horizontal spiral. A little as the specter of a huge squid in an oceanic bottom gone iridescent by the thousand fires of a weighty sun. “The Passing” was initially released as a surprise gift by Steve Roach on his birthday at February 16th, 2017 as “name your price” digital download , but fortunately also a limited CD version was immediately announced. 4-panel digipak edition, limited to 300 copies with immersing cover image by Sam Rosenthal, followed in the middle of March and it’s quite obvious I couldn’t miss another long-form epic carved by one of the truest masters of this format. Although recorded during a five-day period prior to above mentioned Steve’s birthday, the origins of this composition go back to the second half of the 90’s when “Dreaming… Now, Then: A Retrospective 1982 – 1997” 2CD compilation was released on Celestial Harmonies. And there can be celebrated among many other essentials also a piece entitled “The Passing Time”, a 12-minute unreleased archive track from 1997, which closes the second disc and presents Steve Roach at the most majestic vertex of his aural profoundness. Now this utterly poignant delight has been reshaped and expanded to a fully engrossing one hour of emotional exquisiteness. The mastering credit, as usual, goes to kindred wizard Howard Givens. 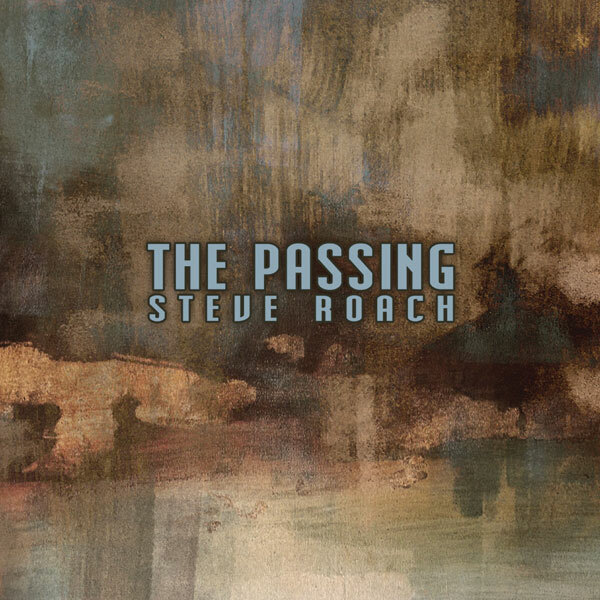 Recorded in the remembrance of lost loved ones, “The Passing” dives into the most intense, yet nectarously sumptuous, harmoniously gratifying and luminously eulogistic zones of heart-rending contemplations ever sculpted by Steve Roach. After nebulously subterrestrial monument “Fade To Gray”, released only several weeks earlier, the listener experiences here another opus in the Master’s dedication to the long-form magnificence. As far I know, only few copies are left with no re-prints in the future, so if you are still craving for the physical version, don’t wait any second, once “The Passing” CD is gone, it’s gone just like it happened to other milestone “Invisible”! Also don’t forget to explore also “Painting In The Dark” and “Spiral Revelation”, both CDs were released at New Year’s Eve 2016 together with “Fade To Gray”. And the next colossal chapter “Long Thoughts” is coming this summer!! !